Ask Leah: Thrifting Workout Gear & Underwear? I’m wondering- what do you do about workout clothes/underwear? I spend a lot of time in both and while I don’t like buying brand new from a lot of the companies, those are items that-when used- just have that “ick” factor I can’t get past. A washed secondhand undergarment is cleaner than a new one from a department store. For the record: I’ve never had that happen with any but my OWN long-lived workout duds. Here’s why: thrift stores sort through donated clothing and reject a lot of stuff that never makes it to the sales floor. So you are spared most of the truly reeking clothes, and of course you can follow your nose (pun intended) as to what’s on the rack, just as you would with any other thrifted purchase: does it look like it’s in decent condition? Are there pit stains? Does it smell? If it passes those tests, take it home and give it a good wash before wearing. 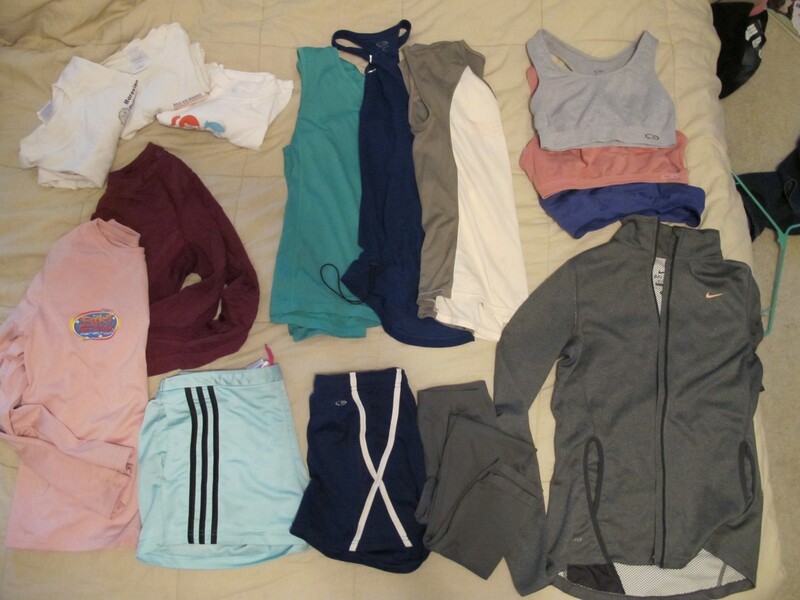 My Workout Capsule Wardrobe This is my workout gear! Okay, most of it—I also have a couple of long-sleeved cotton tees, and a pair of old-school poufy track pants from my highschool soccer team, but the latter only get worn when I travel to the land of subzero workouts (aka New Hampshire). I keep it pared down to just a couple-three versions of things I need, with everything mix/match and layerable. I find it a lot easier to keep tabs on and launder a smaller number of each thing rather than having 16 shirts that all get stuffed in the bottom of the laundry hamper because I always thought I had more coming BUT WHY DON’T I HAVE ANY CLEAN SHIRTS??! Cotton t-shirts: 3 shown here + 1 stuck somewhere in the laundry…. I hate keeping old tees for sentimental reasons but then never actually getting to wear them. 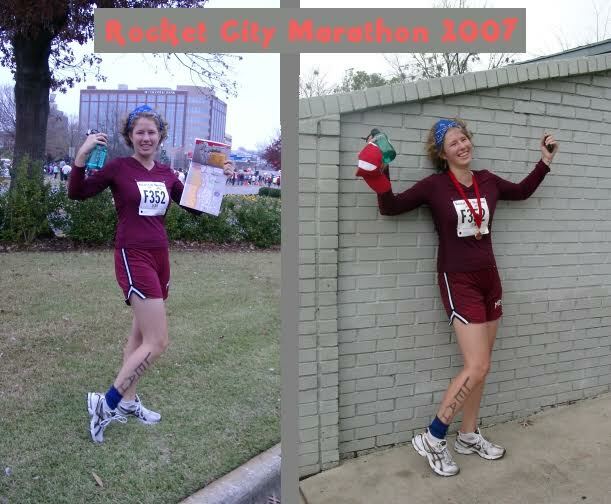 Since I don’t wear a lot of t-shirts in my daily wardrobe, using t-shirts as my running topper in moderate weather or an extra layer over a synthetic long-sleeved in cooler weather lets me keep old favorites in rotation—and it means I start every run with a smile, remembering a work trip or a Katrina cleanup or my childhood church. When it’s just too dang hot to wear anything with sleeves, I pull on a tank. I also layer them underneath cotton long-sleeved shirts in cooler weather when I know I’ll sweat after my body heats up but I don’t want to chafe. The fact that they’re synthetic means they dry quickly and avoid the nasty chafing and clinging-cold-sweat feeling you sometimes get with cotton. These are all thrifted and I’ve never had odor issues with them. Sports bras by Champion: 3 shown here + 1 stuck somewhere in the laundry…. I bought one of these new and once I realized I liked the brand, I thrifted the rest. Because Champion is a Target brand, it’s stocked in mass quantities in stores all over the country, so it’s fairly easy to find in thrift stores. I’ve found Champion’s quality to be pretty stellar—I’ve had these bras for years and only one is starting to wear out. No smell on these puppies either. Leggings are a lot easier to find in thrift stores these days, and the number of patterns out there and flexible sizing makes this an easy, fun thrift. I actually have another couple pairs I use for work that sometimes double as workout leggings; they’re cotton and made by American Apparel, whose made-in-the-USA labor practices make me feel good about asking for them as Xmas presents. Both thrifted. The Adidas are more hip-huggers and have pockets(! ), while the Champions are a little looser. The Adidas are also thicker and are starting to hold onto odor more stubbornly, although they smelled pristine when I first thrifted them. Can ya tell which pic is before, and which is after?? Ha. And that, my friends, concludes this post. Thanks, Whitney, for the inspiration! Email me at leah at thriftshopchic dot com with your own question, or just leave a comment on the blog. What’s in your workout wardrobe? Do you keep it pared down or like having extras around? Would you ever thrift workout gear?? Scroll down to share!